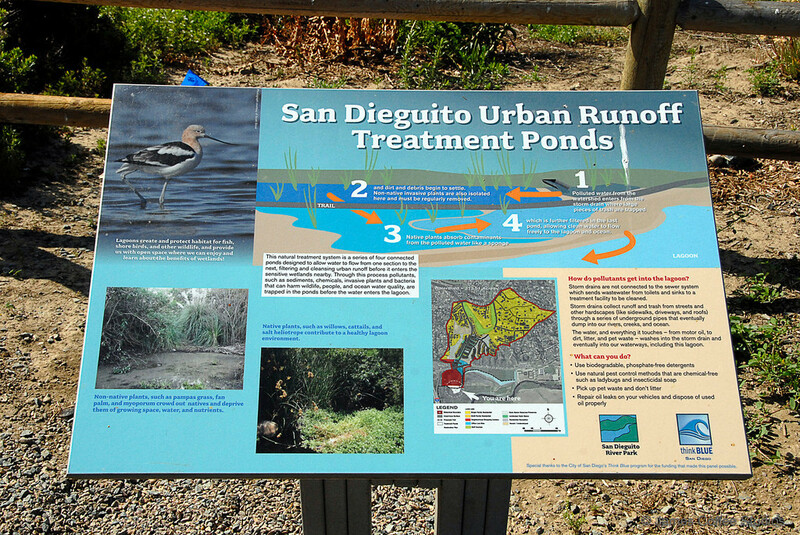 The State Water Resources Control Board awarded a grant of $550,017 to the San Dieguito River Park for the creation of freshwater runoff treatment ponds as proposed in the Park Master Plan for the San Dieguito Lagoon. The project is located east of I-5, south of Via de la Valle, at the end of San Andres Drive. This project includes the construction of a series of four connected water treatment ponds to clean a five-acre site that is impacted by poor quality runoff and construction of an 1,100 foot long segment of the multi-use Coast to Crest Trail through the treatment ponds on top of an existing maintenance service road. The ponds would be constructed predominantly through the natural drainage course by flowing over the weir in the first basin. The low, most polluted flows, would pass consecutively through the other three basins in series before returning to the natural drainage course. The existing telephone company maintenance road in this area would be raised above the water table, and flows coming from the north would be directed underneath. The project would also remove invasive species and replant with native vegetation; install water quality control devices including a trash rack, sediment trap, and oily wastewater separator; and install weirs, culverts and other piping necessary to make the ponds function hydrologically. The subject area is inundated with substantial urban runoff from a 313 acre residential watershed that is funneled via a culvert under a shopping center into the project site. It has been roughly estimated that a residential watershed of that size in San Diego will produce 5,453,712 cubic feet of stormwater each year, and twice that amount, or 10,907,424 cubic feet of urban runoff, each year. Left untreated, the runoff would go directly into the newly restored wetlands, introducing sediment, oily water, chemicals and invasive species. This project will capture and treat that water before it is introduced into the estuarine system. Partnering with San Diego Coastkeeper, Park Rangers and trained volunteers conduct monthly Water Quality Monitoring to make sure the Treatment Ponds are performing as expected. To learn more, and for a link to the San Diego Coastkeeper map showing testing results, please read this blog.